Let’s ease on into this Monday with a super-easy (and super tasty!) 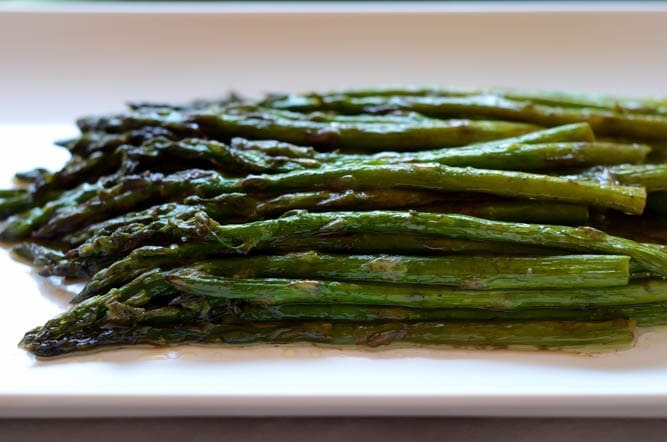 recipe for Brown Butter-Balsamic Roasted Asparagus. This is the perfect, uncomplicated vegetable side dish to whip up with your favorite protein for an easy weeknight meal. It’s been my go-to for quite some time now and basically the only way I prepare asparagus. The nuttiness of the browned butter paired with the rich acidity of the balsamic showcase the roasted vegetable in the most perfect balance of flavors. How can something so simple be so good? Good and simple is most definitely how we roll these days, and I’m sure you feel the same way. Who wants to spend these fun, long days of summer slaving over the hot oven or stove for any significant amount of time? I’m still recovering from attending a wedding in over 100 degree heat this past weekend so that’s the last thing I want to think about right now. But I digress. Back to the very important topic of this post. 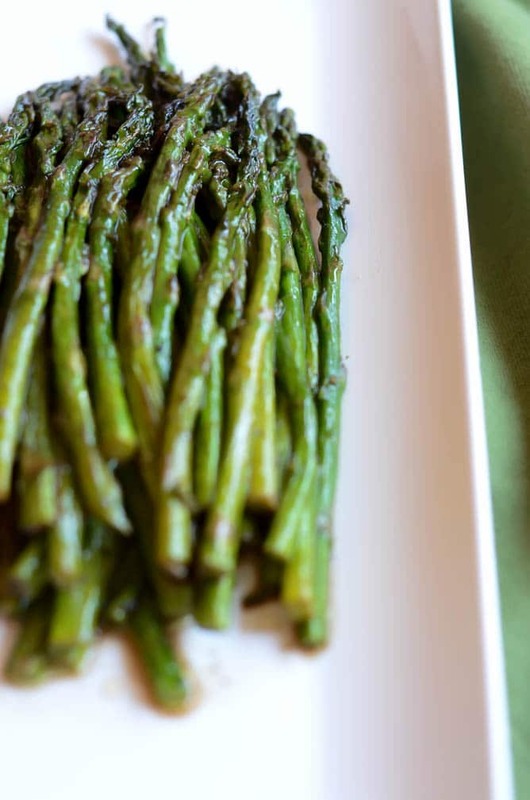 Even though this Brown Butter-Balsamic Roasted Asparagus does require a little bit of cooking time, it’s literally less than 20 minutes, so no sweat there. And, if you really can’t bring yourself to turn on the oven, you can always cook the asparagus on the grill! Then you’ll just have to turn on the stovetop for less than 10 minutes to whip up your brown butter-balsamic sauce to drizzle over top. Easy peasy. The perfect start to a Monday meal, because we all know we need a little extra help on this dreaded day of the week. Let’s kick it off on the right foot and take the week by the horns. Because that’s how we roll, right? 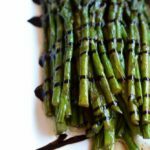 A quick and easy vegetable side dish featuring fresh asparagus bathed in a delicious brown butter-balsamic sauce. Preheat oven to 450 degrees Fahrenheit. Line a jelly roll pan with aluminum foil. Set aside. In a small bowl (or I often use a loaf pan) combine asparagus, olive oil, salt and pepper and mix well. 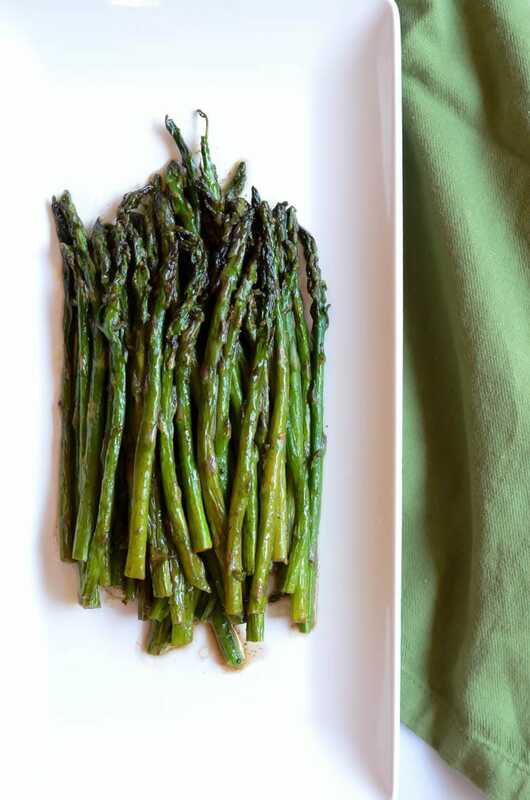 Place olive oil-coated asparagus on prepared jelly roll pan and roast in preheated oven for 10-15 minutes. While asparagus is cooking, prepare brown butter-balsamic sauce. Place butter in a small saucepan over medium heat. Cook until butter has melted and started to take on a golden brown color. Add balsamic and let cook for just a couple minutes more. Remove from heat. Remove asparagus from oven and place in mixing bowl or loaf pan again. 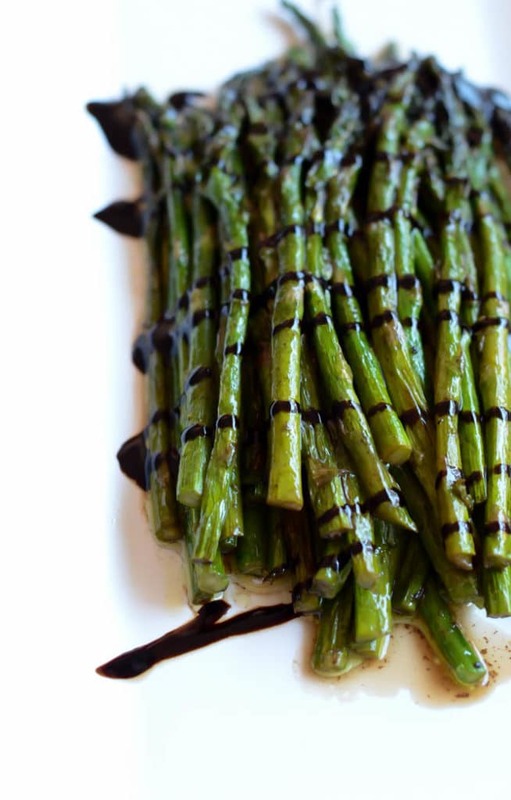 Pour brown butter-balsamic sauce over asparagus and gently toss to coat. Place asparagus on a platter to serve.